Our product range includes a wide range of ribbon blender and double cone blenders. Being a client centric organization, we manufacture and supply a premium quality range of Ribbon Blenders that are used for blending of various materials in a fast and efficient manner. 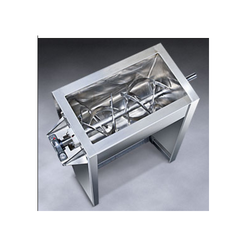 These blenders are featured with U-shaped horizontal trough as well as inner and outer helical ribbons. Used to mix various formulations and ingredients, these products are highly appreciated for their durability. Further our blenders are available in varied configurations and dimensions in the market. Ribbon Blenders are widely used in different pharmaceuticals as well as other allied industries and these are highly durable in nature. These blenders comprise curved horizontal ribbon blades that provide easy operations. We offer these ribbon blenders with an arrangement of vacuum filling and discharge and are featured with cooling as well as heating jackets. These blenders are widely known for their corrosion resistance and we offer them in an efficient manner. Our blenders are available on the basis of the construction of particular proven agitator and dimensions of these products are carefully balanced. These are available with an excellent framework that is efficiently support the bearings and we supply these products with special shaft seals to our clients. 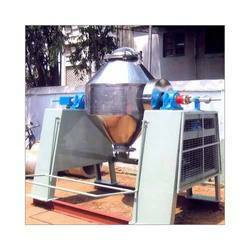 We manufacture and supply a rich assortment of Double Cone Blenders, which comprise A-shaped frames. These products are used for cross mixing as well as good rolling of materials and we manufacture these products using qualitative stainless steel procured from the certified vendors. Our products are used for food, chemical, pharmaceutical and cosmetic products and we offer them at industry leading prices to our esteemed clients. These blenders are available with a start-stop arrangement and limit switch in the market. Our blenders are available as efficient as well as versatile machine along with PLC or HMI based control panels. These Double Cone Blenders are highly acknowledged for their flawless performance and comprise conical ends on both sides. Further, these products have gear that is specially designed for speed reduction and we offer our products with durable finish standards to the clients. Thus, these blenders are available with dust-proof enclosures as well as liquid spraying device in the market. We deliver these products within a prompt time period to our esteemed clients. These products provide fast and continuous mixing of granules and dry powder and available in varied dimensions to the clients.